The Tampa Bay Times discarded its journalistic ethics in reporting on the proposed Hillsborough County sales tax hike for transportation that was spearheaded by the newspaper’s primary benefactor, former hedge fund manager and developer Jeffrey Vinik. The Vinik Tax passed in November with 57 percent of the vote, but is being challenged in a lawsuit brought by Hillsborough County Commissioner Stacy White. The tax, which if upheld, will give a much needed boost to Vinik’s floundering downtown Water Street development and make Hillsborough the highest sales tax county in Florida at 8.5 percent. Vinik created the All For Transportation PAC that promoted the levy by misinforming the public. The Times parroted All For Transportation's talking points throughout the five-month campaign. The Times did not provide a link to the All for Transportation (AFT) five-page charter amendment, so readers were kept in the dark as to the actual language in the tax hike document. 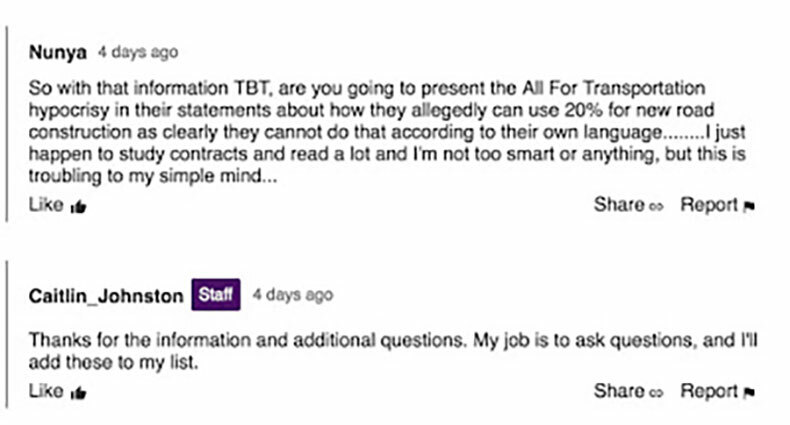 This allowed the Times to run with AFT claims with no back-up evidence and no questions asked. If one reads the entire (AFT) tax hike charter amendment, it reveals how AFT, which is accountable to no voter or taxpayer, would appropriate the sales tax proceeds. AFT’s amendment does not only enact the 1 percent transportation tax, but specifically mandates how AFT decides where and how $16 billion of sales tax proceeds must be spent for 30 years. Missing in AFT’s tax hike amendment is funding for new road capacity. AFT does not appropriate one penny of the $16 billion tax proceeds for new road capacity -- for 30 years. The only mention of new automobile-lane capacity is to prohibit funding it. We raised the red flag about misleading and deceptive language used by AFT and the “no new road funding” issue from the beginning of AFT’s petition drive last June. Commissioner White cited the issues in the public statement he made on Oct. 18 prior to the election. After formal opposition to AFT’s tax hike was launched in October, AFT realized it could no longer hide from the language used in the tax hike amendment. Weeks before the election, AFT was forced to admit it did not appropriate any dedicated funding for new road capacity. AFT then tried to obfuscate the issue by suddenly claiming some 20 percent of funding somewhere “could” be used to fund new roads. The Times ran with AFT’s claims with no supporting evidence. But simple math does not support AFT’s claim and “could” means there is a possibility, no guarantees, just a maybe or perhaps. A breakdown of AFT’s spending appropriations is shown in the two "download" attachments in blue, at the end of this story. But the Times continues the charade. 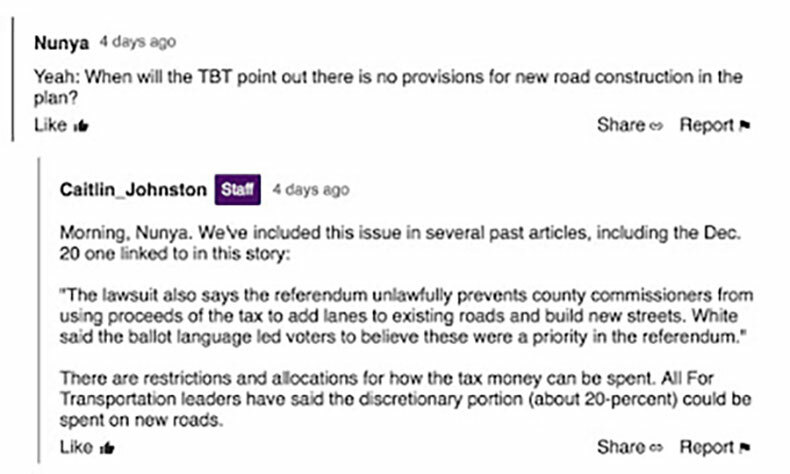 In a Jan. 14 article, "Uncertainty over lawsuit puts Hillsborough’s transportation plans on ice," Times reporter Caitlin Johnston decided to jump into the comments under her own article. The lawsuit also says the referendum unlawfully prevents county commissioners from using proceeds of the tax to add lanes to existing roads and build new streets. White said the ballot language led voters to believe these were a priority in the referendum. Johnston confirms how the Times relied on advanced AFT talking points that are nowhere to be found in the actual language of AFT’s five-page charter amendment. Conspicuously missing was any comment from AFT. But Times reporter Johnston felt compelled to jump in and blindly cite claims made by AFT. The words “can”, “could” or “discretionary” are nowhere to be found in AFT’s charter amendment. AFT can just concoct false claims and the Times runs with it. 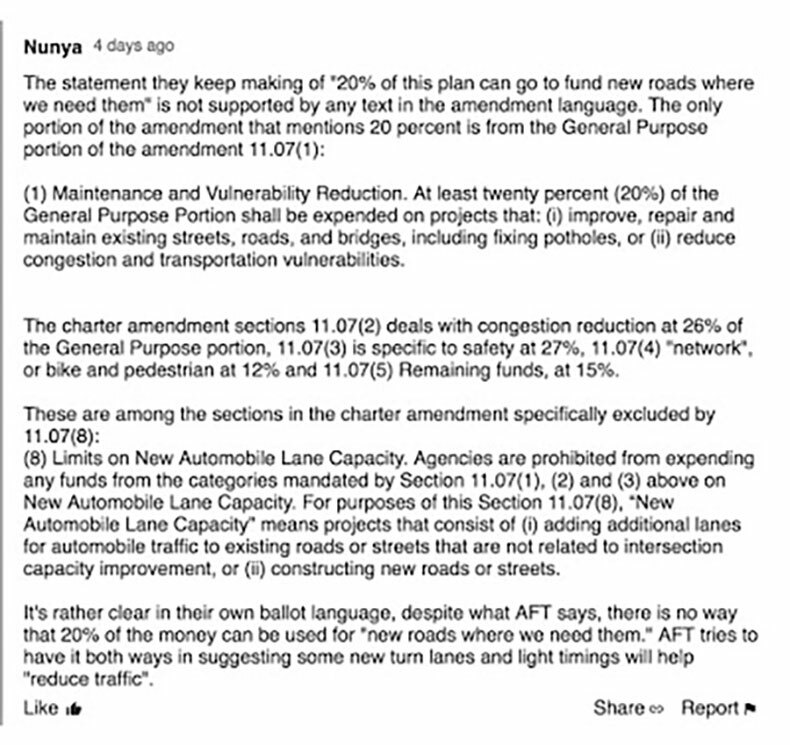 Commenter “Nunya,” above, cites specific language straight from the charter amendment, which many frequently noted, that AFT’s 20 percent claim is not true. Astoundingly, Johnston responds as if she never read the charter amendment and the actual language is new information for her. How can that happen? The Times has been reporting about the AFT transit tax since the petition drive began June 15, 2018. Where’s Politifact, the alleged true-false research arm of the Times? Why isn’t Politifact scrutinizing the Times' reporting and AFT’s claims? Easy. Neither would pass muster. The traditional role of the media is to ask questions. Johnston admits in her comment that is part of her job. But questions about an important election issue -- a 30-year, $16 billion tax hike -- must be asked when they are most relevant -- before the election. The Times failed miserably to do its journalistic job. The Times violated the Principles of Journalism. The financially distressed Times cannot “ruffle the feathers” of the financial benefactors who bailed out the paper in 2017. Those financial benefactors include Vinik, Frank Morsani and Darryl Shaw who became major financial donors to AFT’s tax hike campaign. Vinik and entities he owns contributed almost 25 percent of the $4 million AFT has raised to date. "Jeff Vinik said Friday that it’s local politicians, not the business community, who are holding Tampa Bay back when it comes to transit." "But any transit plan would need the support of local politicians, most notably the county commissions, to allocate money and approve the project." In 2017 the Times understood appropriations authority is vested with duly elected county commissioners, which is correct according to FS 212.055. Therefore, the failure of the Times to inform the voting public of such critical information in 2018 was obviously intentional. AFT, the Times, and their financial benefactors decided to attempt an end run around the appropriations authority statutorily vested in duly elected county commissioners with AFT’s tax-hike charter amendment. The Times relinquished its media role as independent and neutral watchdogs to become the protectors and promoters for the agenda of its wealthy financial benefactors. Propaganda includes the use of biased and misleading information to promote a particular point of view and selective filtering of information to control public perception. The Times is the propaganda arm of All For Transportation. What I find so troubling is the people are so willing to accept a massive tax increase and buy the Ken Hagan -Vinik line! No doubt they believe a regressive tax is good, not realizing it is small business that comprise so much of Hillsborough business community that will suffer not just the poor. The Tampa Bay Times has its agenda ... the Sunshine State News has its agenda. So what? Fox News has its agenda ... MSNBC has its agenda. So what? Given the mindless and absurd partisanship in this country ... what's the big deal! Partisans have been favoring whatever media tells them what they want to hear for quite a while ... ESPECIALLY since the advent of the internet in the mid-'90s. If you don't like the Tampa Bay Times ... don't read it. For me, I gave up on Fox News about ten years ago when it became clear that they were becoming freakishly rightwing. As long as abject partisanship exists ... there will be media selling one thing or another to the partisans. If you swallow what the TBT is dishing out you're going to get sick,bon appetit. You cheated and we won't get over it. Tyler Hudson sent me an unwanted text promoting the tax. I replied stop texting me, it's a fraud. He replied with a meme of a dog laughing, "hehe." That's the kind of people you are. The people were defrauded and I hope Comm. White's lawsuit prevails. Democrats only know how to tax and spend. Other people's money. hehe!! ;^) I guess you don't understand the big majority who voted was their money knew exactly what was going on and is why we voted for it...……... Isn't that obvious or you that dumb like other posters here? ............White's lawsuit has no standing and will lose. …………. He's just pizzed that he can't demand where the money is spent as after 20 yrs of repub commission, we just got tired of their BS and blocked them out and voted them out...….. Deal with it. It's call democracy. You are the typical bamboozled Hillsborough voter, “Jerry.” The morons that voted “yes” to impose the highest sales tax in Florida are paying to salvage con man Jeff Vinik’s failing downtown development. The tax also makes Hillsborough businesses uncompetitive and destroys the hospitality industry. Crime boss Vinik misrepresented the transit program and you fell for it, Goober.